Wow there's people giving this a one star because the guy hits the girl sometimes for being stupid. It's comedy and obviously they're close. Same people would probably find the mc in chuunibyo playfully hitting rikka or spinning her around in a chair funny. But noo, this show doesn't fly, whereas there's a billion shows with tsundere and yandere girls hitting the guy 24/7 that get decent reviews. One show with a guy doing it and everybody loses their crap. This show has some pretty good humor. It's not emotionally moving or deep, but if you want 4 snippets of 3 minute comedy in a 12 minute package per episode, this show has it. There is no actual violence or abuse. The girl getting beat is more of a reverse Toradora. If you've only studied gender studies your whole life and view everything as a result of the male patriarchy dominating over your life, the door is to your left. Seriously, if you can't stand seeing a girl get beaten up for comedy effect, there are plenty of other shows you can watch. This probably isn't for you, unless you are one of those people who loves to be offended about things so that you can later blog about it, then you will watch the whole thing. BUT if you don't have a stick protruding from where the sun don't shine, like slapstick and hilarious one liners, you will enjoy this. Edit: After 2 episodes, 4.5 rating, you round up, aho. Dumb slapstick comedy, that will make you laugh out loud, which is rare. I've only watched the 1st episode but for now it has a 5/5 from me. We'll see if they can continue this level of funny. Will update if it stops being funny but if it continues the Three Stooges slapstick, I'm in for the long run. Read the Manga, lets see how the anime goes! I'm seeing the one stars and I am surprised because they dislike the guy hitting the girls which will be a recurring thing. I mean the show translates close to "Idiot/Stupid Girl", i have read the manga and it is a comedy with some romance features. The girl says she will marry the guy, guy is against it because of the dumb things the girl does. If the anime is anything like the manga then I'm looking forward to it; be nice to have a comedy to go along with the "In another world with a smartphone" anime coming this month. 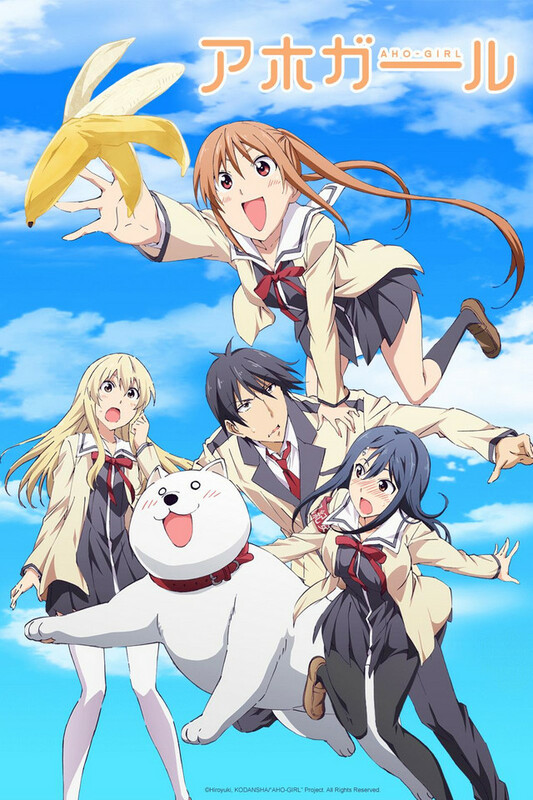 I'm only giving 4 stars because after reading the manga there are moments where i think "too stupid" but as i said earlier, overall it is a nice anime if your looking for a laugh. Excellent writing with deep plot and rich well fleshed out characters. Great for adults and large kids alike. Great stuff here. I just wish the episodes were longer. Really looking forward to season 2 if there is one. Please let there be one. I'm the greatest. If you like just a short funny as heck anime, this is it. If you are someone who wants an actual story then just go some place else since this anime isn't story based its purely comedy based. This anime is from a 4-koma manga so its something extremely comedic with no story. If you feel like a guy punching a girl isn't something you want to watch, then you have bigger problems for not accepting gender equality. A woman punching a guy anime are always hits but people get their bananas in a twist when they see the other way around. Its just a comedy anime the girl, yoshiko sometimes needs to be hit to know when to shut up and the male a-kun does it only either for punchlines or to make her shut up if she goes over board. How does one accurately describe this? A show of this nature has the uncanny ability of surprising even the most veteran of anime viewers with the absurd personality of its namesake. It makes me shudder when I realize that there are people of her caliber running amok in the world, having children and passing their unnerving traits along to others. Feel bad for her friends, feel bad for her parents, but at least she gets her daily allowance of potassium. Words fail to accurately describe this show, so I shall leave you with this Monty Python GIF if you would like a brief explanation of its content. I dropped this on the first episode. With Episode 10 having come out, my friend convinced me to watch this, and I binged it all last night. It is nothing groundbreaking, but what is? Does it need to be? It is not thought provoking either, but its humor does not feel demeaning by simply having an unintelligent girl acting idiotic while eating bananas, premise wise anyway. Why I dropped it in the first place was that it mostly seemed boring and without any effort. Yoshiko and Akutsu are the traditional tsukkomi and boke, except Yoshiko seems more irritatingly impulsive, and her stupidity lacked the charm of the early Patrick Star, mostly because she did not seem to have that much in general principles either. Just a child without any limits, and to be fair, that still holds. Beyond that, episode 1 hardly had any gags worth guffawing over, except the pornographic scheme by Yoshiko, which made me chuckle. The problem with the first episode is that it does not establish the show for what it is quite yet. This show isn't just about the comedic duo, but a rather strange menagerie of characters, that although one note, are only needed to play their roles, and together, this is gut busting hilarious if you enjoy this genre, which I do. Characters do not necessarily need to be three dimensional if the story does not demand it, and the problem is that some often ask the wrong thing from certain anime, that functions more as inherent genre hate than trend specific criticisms. That being said, I find it hard to define why I find this humorous, other than the natural cross cultural nature of slapstick. I dislike the praise of the "Boy actually hits girl for one" argument. It is just a gimmick, and doesn't justify the humor of the show. Akutsu, the main character, is one of the funnier males protagonists, and operates as a deconstructed stoic badass, in which he is not really, in contrast to an ascetic self control that is desired among males in Japanese culture. His reticent is is belayed by his shows of anger towards Yoshiko being a complete idiot, and a rude one at that. If I had to say why he is funny, he is just as ridiculous as Yoshiko is stupid. He hangs out puts up with Yoshiko, despite her lack of self control. He studies constantly, he goes out of his way to be alone, which is noted as being especially bizarre, and best of all, he offers the most biting comments towards the rest of the cast, whose reactions are just as notable as they are humorous, most of the time. He says what we want to say, as if he was more Simon Cowell than male protagonists, and this works well not with Yoshiko, but with the rest of the cast, from Yoshiko's mom, who attempts to set the two of them up so she won't have her hands full, to the beautiful and mild manner Sayaka, wondering "Why am I even here with these people", to the yandere in denial Discipline Committee head, who uses said authority to stalk Akutsu in a rather poor abuse of power. Yoshiko is annoying, but this is largely made up for via character interactions beyond Akutsu, and this is the best reason why this anime is hilarious to me. The interactions are usually great, and Yoshiko acts best more as an instigator of events than whose reaction we are suppose to laugh at. That is how best I can describe it. First episode is mediocre due to introducing of characters, but it picks up quickly. Best character is the dog, best girl is Yoshiko's mom.